Eyelashes go through a three-phase growth cycle. Long, thick eyelashes are touted as one of the most desirable features a person can have. Thousands of products are sold to enhance the look of lashes, from mascara to lash conditioner to lash extensions. So, when you wake up in the morning and notice an eyelash or two that have fallen out and are resting on your cheeks, it can be a little unsettling. But it's important to understand that this is normal process, because like every other hair on your body, eyelashes are perpetually moving through a natural growth cycle. Eyelash FunctionEyelashes aren't just a pretty feature on the body; they have a very specific and important function. Eyelashes are designed to prevent objects from getting in the eyes. Each eyelash is actually a sensory hair that reflexively shuts the eyelid whenever it is touched by dirt, dust or anything else that could possibly get in the eye. The upper lid typically has about 90 to 150 lashes on it, while the bottom has between 70 and 80 lashes. Most eyelashes grow to be about 10 mm long (just over 3/8 inch). Eyelash and Hair Growth: Although it may not seem like it, hair growth is a preset function of the body. Every hair on your body follows a specific growth cycle and will grow to a specific length. Hair follows a three-phase growth cycle and eventually falls out, which is typically nothing to worry about. Anagen (Growth) Phase: The anagen phase is also called the growth phase. This is the phase when lashes are actively growing, and it lasts between 30 and 45 days. Only about 40 percent of the upper lashes and 15 percent of the lower lashes are in the anagen phase at any one time. Each lash will grow to a specific length and then stop. Catagen (Transition) Phase: The catagen phase is also known as the transition phase. During this phase, the lash stops growing and the hair follicle shrinks. If an eyelash falls out or is plucked out during this phase, it won't grow back right away because the follicle needs to complete the catagen phase before it can move on to the next one. This phase lasts between two and three weeks. Telogen (Resting) Phase: The telogen phase is also referred to as the resting phase. This phase can last more than 100 days before the eyelash falls out and a new one begins to grow. Because each individual lash is in its own phase of the growing cycle, it's normal for a few lashes to fall out most days. It typically takes between four and eight weeks to fully replace an eyelash. All natural lashes are unique to each individual and can have extreme variance in length, fullness, color, curl and individual eyelash diameter. All of these factors play a part determining how long, thick and full your lashes extensions will look. I will only apply lash extensions that will insure that the integrity of your natural lashes are not be compromised. Other factors that can play a part in the final result and longevity of your lash extensions are your eye shape, eye size, eyelids (hooded, deep set, etc. ), how oily the eyelash hair and your skin tends to be and how watery your eyes get on a daily basis. Thick, dark natural lashes are strong enough to allow for thick, dark lash extensions. This type of lash can look very nice with only the outer tips enhanced because they blend nicely with the lash extensions. Long, thick natural lashes allow for longer lash extension lengths. The longer your natural lashes are - the more surface area for the lash extensions to adhere without drooping. The advantage of added extensions to this type of lash is that you do not have to curl and use mascara everyday. 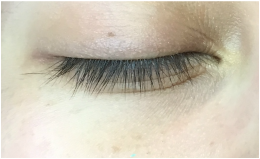 This example is the most common type of natural lashes. Moderate fullness and length. Although, notice the gap - keep in mind that if you have gaps in your natural lashes then the gap may appear more noticeable when the lash extensions are applied. This only way to bridge this gap is with the Russian Volume technique. Pale, blond lashes - this type of lash can take longer to apply due to the invisibility of the individual blonde lashes. For a natural look, dark brown lash extensions are available for blonde natural lashes. Some people choose to tint their lashes first to give the extensions a fuller darker look. Tinting must be done 1 week prior. Very fine, thin, short and sparse lashes. Individual lash extensions will have a 'spider-leg' look when extended. I strongly recommend the Russian Volume lash technique if your natural lashes are similar to this photo.